Joshua Tree, Calif. • The government shutdown has left America’s national parks largely unsupervised. No one is at the gate. No one is collecting a fee. The visitor centers are closed. There are some law enforcement and emergency personnel on site, but certainly nothing as standard as a park ranger who can answer a question. People are streaming into the parks, enjoying the free access, but they're finding trash cans overflowing and restrooms locked. Vault toilets are not serviced, and there's hardly a flush toilet to be found anywhere. If nature calls — well, the woods are over that way. "Once those port-a-potties fill up there's no amount of cleaning that will save them," said Sabra Purdy, who along with her husband, Seth, owns the rock-climbing guide service Cliffhanger Guides in the town of Joshua Tree. 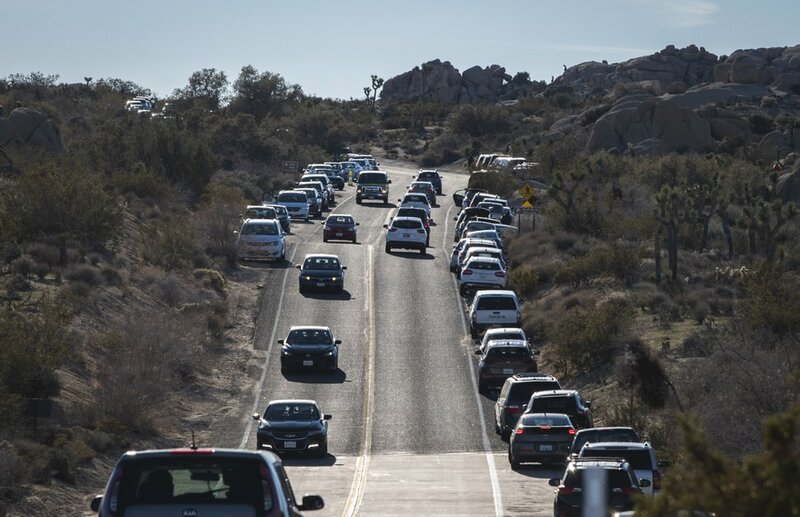 (Stuart W. Palley | The Washington Post) Heavy traffic near Skull Rock in Joshua Tree National Park on Saturday. The federal government shutdown meant that essential services in the park like restrooms and campgrounds were not maintained, and wilderness rangers were not present to help inform visitors of park features and advise them of the rules. As a result volunteers helped clean up bathrooms, but visitors also drove offload and illegally parked. "It's not quite 'Lord of the Flies' yet," said Bryan Min, 30, who traveled to Joshua Tree with friends from Orange County and are camping outside the park. "Who knows how it'll be tonight." The partial government shutdown, triggered by the dispute between President Donald Trump and Congress over funding for a U.S.-Mexico border wall, is now well into its second week, with no resolution in sight. Democrats, who take control of the House on Thursday, plan to vote on a bill to open much of the government while denying Trump money for the wall. The president, in a tweet on Tuesday, rejected the legislation that provides border security money but no funds for the wall. Some parks across the country have remained partially operational with state funding. Government shutdown contingency plans adopted by the National Park Service last year have allowed many national parks to remain accessible, but without staffing. The result is that “closed” parks are essentially wide open, and in some cases that gives them a Wild West vibe. The Park Service runs a broad constellation of parks, monuments, battlefields and historic sites. At Antietam National Battlefield in Maryland, the visitor center has a small notice on the front door advising visitors "to use extreme caution if choosing to enter" park property. On the hallowed ground, where the Army of the Potomac collided with the Army of Northern Virginia in the bloodiest day in American military history, the flagpole in front of the visitor center remains conspicuously bare. The access road to Maryland's Great Falls of the Potomac, part of the C & O Canal National Historical Park, has been blocked. At midday Tuesday, hundreds of cars were lined up on nearby neighborhood roads and streets as people walked into the park, many taking advantage of the canal towpath, which remains unblocked. 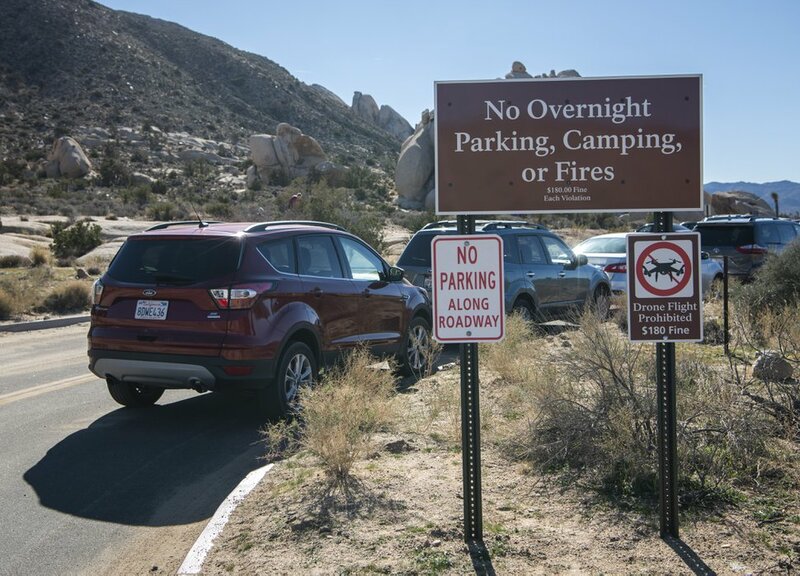 (Stuart W. Palley | The Washington Post) Cars illegally parked in a fire lane despite clear signage at the Ryan Mountain trailhead Saturday in Joshua Tree National Park. During a government shutdown in 2013, Joshua Tree was closed to all visitors. 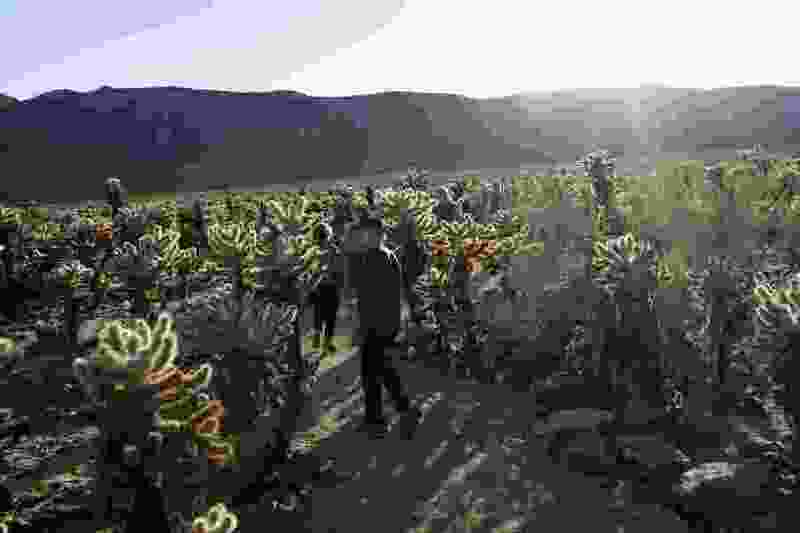 The winter holiday season is a busy time here and important for local businesses, and some people are grateful that the park hasn't blocked access this time, said Kenji Haroutunian, president of Friends of Joshua Tree, a nonprofit local climbing organization. Greg Henington, owner of Far Flung Outdoor Center in Terlingua, a town just outside the park, said he voted for Trump but blames the president for the shutdown, which he says creates confusion and uncertainty for local businesses. "If we are going to continue to use the federal government as a weapon for not getting what we want in the sandbox, then this is untenable for small business. We can't make decisions, we layoff employees, we take cancellations," he said. In Death Valley National Park, employees of The Oasis at Death Valley, a private resort inside the park, have joined other concessionaires in picking up trash and cleaning bathrooms, said Trey Matheu, general manager of the resort. "We're in it for the long haul," he vowed. At Yellowstone National Park, access this time of year depends on grooming of snow-covered roads — but the National Park Service's shutdown plan does not consider such activity to be essential. That means the private concessionaires have had to pool their money to pay for the grooming. "I think they actually provide better rolls than the government," Krafton said. "It's better quality paper." Waters reported from Big Bend National Park, Achenbach from Washington, D.C. The Washington Post’s Emily Wax-Thibodeaux contributed to this report.